(3) As a bride. 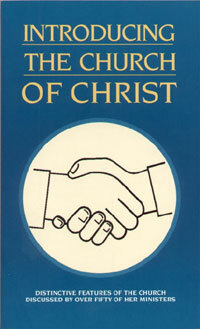 The church is married (spiritually speaking, of course) to Christ. Paul wrote to the church in Corinth and said, "I espoused you to one husband, that I might present you as a pure virgin to Christ" (2 Cor. 11:2). In writing to the Ephesians, he compared the relationship of a husband and his wife to that of Christ and his church. "Husbands, love your wives, even as Christ also loved the church, and gave himself up for it" (Eph. 5:25). Therefore, the church should be a "glorious church, not having spot or wrinkle or any such thing; but that it should be holy and without blemish" (verse 27). Note also Romans 7:4.